Homepage. This page: Confirmation of a course run by Rootes Group at their Aldermoor Lane factory. Singer Chamois training course held in 1965. This snippet of memorabilia turned up in a pile of old paperwork, saved from a garage that was being cleared. It was sent to a Mr L.G. Burrell who worked for C.S. Scotney & Son Ltd of Boston, Lincs, from the Rootes Group training school. The letter confirmed his attendance to a Singer Chamois Technical Course, to be held on the 15th - 19th November 1965. 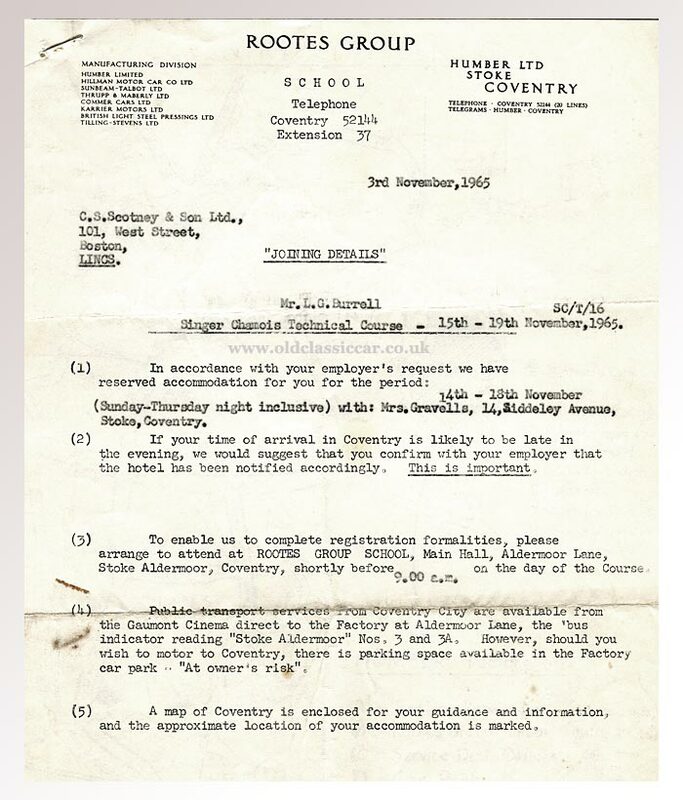 The information on the letter heading is also of interest, to the left is a list of all the marques that made up the Rootes Group - namely Humber Limited, the Hillman Motor Car Co. Ltd., Sunbeam-Talbot Ltd., Thrupp & Maberly Ltd., Commer Cars Ltd., Karrier Motors Ltd., British Light Steel Pressings Ltd., and Tilling-Stevens Ltd, all names that have faded into history alas. The attendee had been booked to stay over with a Mrs Gravells, of Siddeley Avenue, Coventry, another reminder of how much a part of Coventry the British motor industry once was. The course was to be run at the Rootes Group School, Main Hall, Aldermoor Lane, Stoke Aldermoor, Coventry, starting at 9.00am. 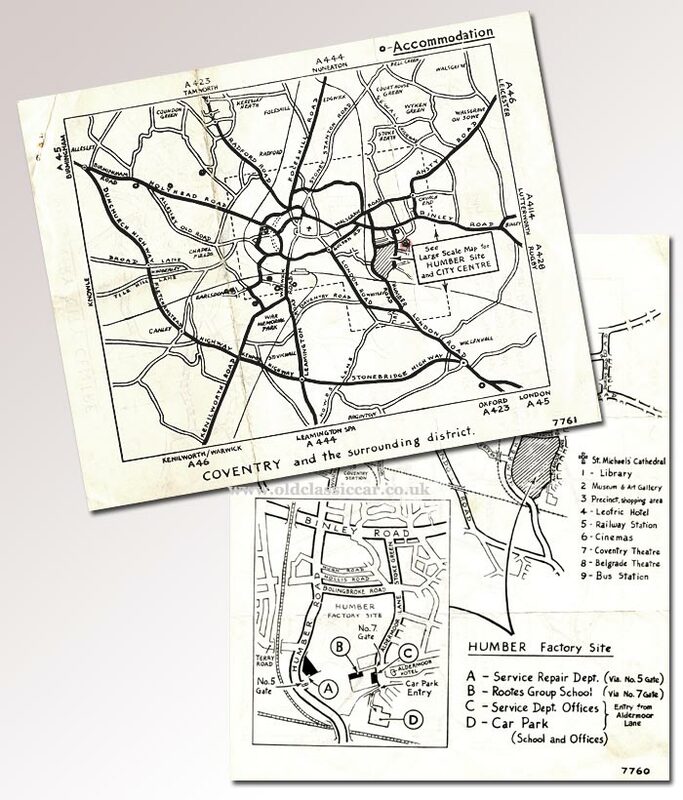 Attached to the letter is a map showing the location of the Humber Factory Site, with instructions on how to find the entrance off Aldermoor Lane (No.7 Gate). What was the Singer Chamois? 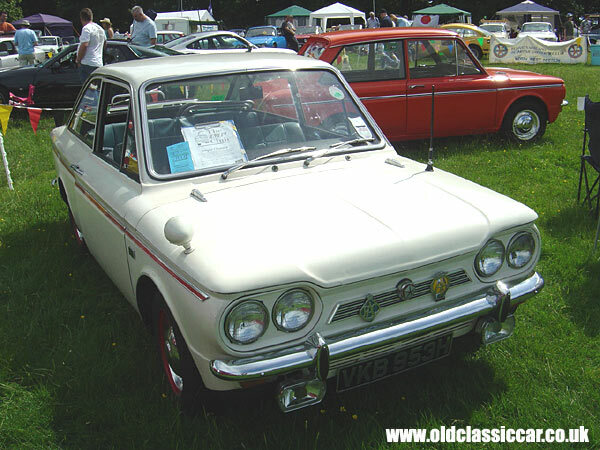 The Singer Chamois, first offered in 1964, was a badge-engineered upmarket version of the Hillman Imp, one of several variations dreamt up using the Hillman's basic design. Two versions of the Chamois were ultimately offered, the initial Chamois that used the familiar Imp bodyshell, the other, from 1967 onwards, sharing a fastback Coupe design with the Sunbeam Stiletto. Inside, the occupants benefited from a higher specification of trim when compared to the Imp, including a smart wooden dashboard - with extra instrumentation included - and comfier seats on which to park one's behind. From October 1968 the Chamois and Chamois Sport featured a new four-headlamp front end treatment, although the interior trim was downgraded at the same time. Production of the Singer Chamois ended in January 1970. Seen below, an example of the Chamois Coupe.